What’s the best way to become an electrician these days? What’s the fastest way to extend your electrical skill-set if you’re already working in the trade? With a wide range of different training routes available, and a variety of different job roles in the industry, it can be a little overwhelming. If you’re feeling a little confused as to where to start in your journey to becoming an electrician, or you’re looking for the best way to add new electrical capabilities to your skillset, you’re in the right place. We’ve put together this handy guide to provide you with a clear plan to progress your career as an electrician. Whether you want to become a fully qualified sparky, a domestic specialist or a multi-skilled master, read on to understand the best qualifications and training options available to you today. Is now the right time for me to become an electrician or invest in my electrical skillset? Arguably there has never been a better time to become an electrician, or a more lucrative time to invest in extending your electrical skills. If you are deliberating over whether this is the right time to commit to taking a course, we’ve compiled some key stats that demonstrate just how lucrative electrician training can be right now. Each year, the Office for National Statistics (ONS) compiles data on working in the construction sector. For a number of years, electricians have come out on top as the best paid of all tradesmen. Last year in 2018, the average UK salary for an electrician was £30,784. In 2019, it’s been another lucrative year for sparkies. Electricians not only remain the highest paid tradespeople, but they also enjoyed the highest salary increase of 5%. In addition to being well rewarded for their work, electricians are also in high demand. Skilled trades are amongst the most in-demand in the UK today, yet employers are finding it difficult to fill vacancies. The demand for electricians is far exceeding supply. The Employer Skills Survey, by the UK Government, reports that around a quarter of all job vacancies in the UK are driven by a shortage of skilled workers. In terms of the trades, 43% of skilled trades’ vacancies are due to companies being unable to find people with the right skills, with 13% of vacancies being for electricians. Whether you’re looking to change career, or you’re already an electrician and want to add new lucrative skills or services to your metaphorical toolbox, there’s never been a better time to gain a new electrical qualification. What’s involved in becoming an electrician? If you’re looking for a career switch, perhaps to ditch the desk job and pursue a more rewarding and active skilled profession, all the signs indicate that you will find yourself very much in demand in the coming years. For those already in the trade and looking to skill-up their electrical capabilities, the growth market for electrical skills means that you are better placed than ever to ‘cash in’ on your electrical training investment. What are the essential qualifications to become a qualified electrician? Fully qualified electricians, that are able to perform electrical maintenance or electrical installation work unsupervised, are in high demand today. To become a fully qualified electrician, you need to get an industry recognised NVQ qualification. For new entrants and electricians with less than 5 years’ experience, who already hold NVQ 2365 Levels 2 & 3, there are two NVQ 2357 qualifications available which will enable you to apply for your ECS Gold Card and JIB Grading, upon successful completion. How about qualifications to advance your career when you’re an experienced electrician? If you have been working in the trade for five years or more, the NVQ 2356 ‘mature candidate assessments’ are ideal to verify your skills, expand your services or apply for your ECS gold card or JIB grading. Online electrical training is a quick, convenient and cost-effective way to gain essential mature candidate qualifications that can validate the skills that you are using at work. Crucially, online electrical courses mean that you can gain your qualification without having to take valuable time off work. XS Training offer a range of online electrical courses, for candidates with over 5 years of industry experience. Experienced candidates who successfully complete any of the NVQ2356-99 courses below also become immediately eligible to apply for their JIB Gold Card. See the full range of NVQ 2356 Experienced Worker training courses from XS Training. To find out more about online NVQ electrical courses, or to get started with your NVQ, call our friendly team on 01535 657059 or email us now at enquiries@xstraining.com. How quickly can you train to be an electrician? Traditionally, there were two main routes to becoming an electrician, either you attended college or completed an apprenticeship. In the past, it took a while to qualify as a fully licensed journeyman electrician. In fact, it typically takes four years to complete an apprenticeship or a college course. Obviously, four years is a significant amount of time. The good news is that times have changed. There are now a wide range of online electrical training paths available today, including ‘fast track’ options. These days, you can train for skilled trade qualifications online, working around your day job in the electrical industry, at times to suit you. A wide range of online training options are available to you to get the necessary qualifications to become an electrician, and quickly. What is the fastest route to get Level 3 electrical qualifications? Quite simply, online electrical training is the fastest and most convenient way to attain your electrician qualifications. With an online electrical training course, you can work on compiling your evidence for your NVQ Level 3 portfolio when it’s convenient for you. Crucially, you can also take the course at your own pace. If you want to qualify as an electrician in record time, you are in control of your own schedule with online training. For example, with XS Training’s Level 3 NVQ 2356-99 Electrical Maintenance course, we provide remote site observations so you can qualify for your NVQ as quickly as you want to. How do I become a certified electrician online? 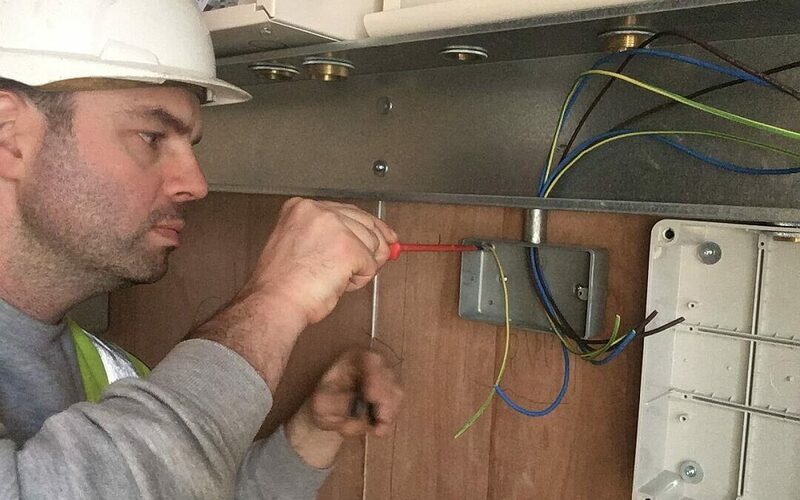 XS Training provides a range of industry recognised Level 3 electrical training courses which enable you to become an electrician or extend your electrical skillset if you’re already working in the trade. By completing the NVQ 2356-99 and NVQ 2357 Electrical Training Courses, you will have everything you need to apply for your JIB grading (Gold Card), in no time at all. With the 18th Edition Online Training Course, you can gain the all-new IET Wiring Regulations qualification, as quickly as you wish to, in your own time. Why choose XS Training for your online electrical Training? Bespoke online training system – our easy to use online portfolio system means you can easily compile your NVQ evidence portfolio from the comfort of your own home. Remote site observations – we provide live remote site observations via mobile phone. Our assessors carry out live observations of you without them having to visit you in person. With remote observations, you can complete your NVQ quickly and conveniently. Easy applications and immediate starts – simply choose your online electrical course by clicking the link on your chosen course page or by completing our electrical training application form. Enrolling on the course is quick and easy, so you can get started right away. Fast responses from experienced electrical trainers – when you have a question about your NVQ, our experienced and expert electrical trainers respond fast so you can move swiftly on. We usually respond the same day or within 24 hours at most. Affordable monthly payment plans – we offer interest-free monthly payment plans on all packages. Over 50 locations around the UK to take your final exam, the AM2 Practical Assessment, for courses which require it. Outstanding service – at XS Training, we take pride on delivering outstanding service to our fellow electricians. Don’t just take our word for it, see our many testimonials to see what our many happy clients have to say about us. How do I get started with online electrical training? There’s never been a better time to invest in developing your electrical skills. Today, online electrical training is the fastest, most convenient and cost-effective way, to gain in-demand electrical skills. XS Training are established as a leading UK online electrical training provider. Why wait? It’s the ideal time to get started training for your NVQ today! Call us on 01535 657059, or click here to get your questions answered. ← Why Study The 18th Edition Course Online?